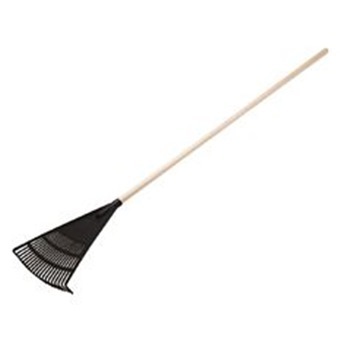 PLASTIC GARDEN LEAF RAKE #2021 WITH 4 FT WOOD HANDLE is rated 1.0 out of 5 by 1. Rated 1 out of 5 by matt ng from the plastic head keeps dropping off The female part of the plastic head has no threads. The supplied wooden pole has thread so it doesn't grip the head when inserted. The head keeps dropping off when raking leaves.